All cells in our body, especially our brain cells, burn glucose for energy, similar to the way car engines burns petrol. Part of this may be due to hot weather, sleeping late, or just psychologically feeling that its summer and you need a break. However, for most of us our responsibilities do not change, we still need to work, study, and perform our daily chores. Even though, with some simple changes to our eating habits and lifestyle we can, God willing, find the energy to experience a more enjoyable and productive summer. It is therefore crucial to maintain a constant energy supply to avoid sudden dips in your blood glucose levels that could lead to sleepiness, exhaustion, irritability and increased hunger, which in many cases leads to poor food choices. Does this mean we should eat more sugar to keep our blood sugar balanced? Absolutely not! It is important to realize that any food we eat is broken down into glucose before it is used by our body. Refined sugars, such as table sugar and products made from white flour (e.g. white bread, pasta and biscuits), take very little time to be broken down into glucose, and are rapidly absorbed from our gut, causing blood sugar levels to rise above normal. As the body tries to regulate this, it quickly secretes a surge of insulin into the bloodstream, which decreases blood sugar levels a little lower than its normal range, leading to the manifestations mentioned above like excess hunger and tiredness, after which it slowly regulates itself (Weatherby, 2004). Thus, ideally we want a meal that will give us a slower and a steadier release of glucose into the blood. Remember that God created grains with a cereal germ, endosperm, and bran for a reason. These parts of the grain have been shown to contain most of the beneficial nutrients that many of us lack today, such as iron, B vitamins and magnesium which are essential nutrients for energy (Joseph E. Pizzorno Jr., 2008). It is therefore quite important to eat those grains in the closest form to that they were created in. Common examples are brown rice, oats, barley, whole meal and multi-grain bread. Eating more frequent, but smaller meals has been shown to help control your blood sugar as opposed to skipping meals and eating a bigger meal later in the day (Liska, 2004). Psychologically, you won’t feel the need to fill your stomach when you know that you will soon have another meal or snack. Physically, your body is affected by a concept known as “The second meal effect”, which is the ability of one meal to improve the glucose tolerance of the next meal. I believe this concept is a key to help us follow in the footsteps of our beloved prophet (PBUH) when he said: “No human ever filled a vessel worse than the stomach. Sufficient for any son of Adam are some morsels to keep his back straight. But if it must be, then one third for his food, one third for his drink and one third for his breath.” Narrated by Ahmad, At-Tirmidhi, An-Nasaa’I, Ibn Majah – Hadith sahih. Remember, eating healthier does not mean depriving yourself and feeling hungry. On the contrary, it simply means filling up on the right choices. A simple solution for this is to include the right ratios of protein, essential fats, and complex carbohydrates (from vegetables as well as starch). 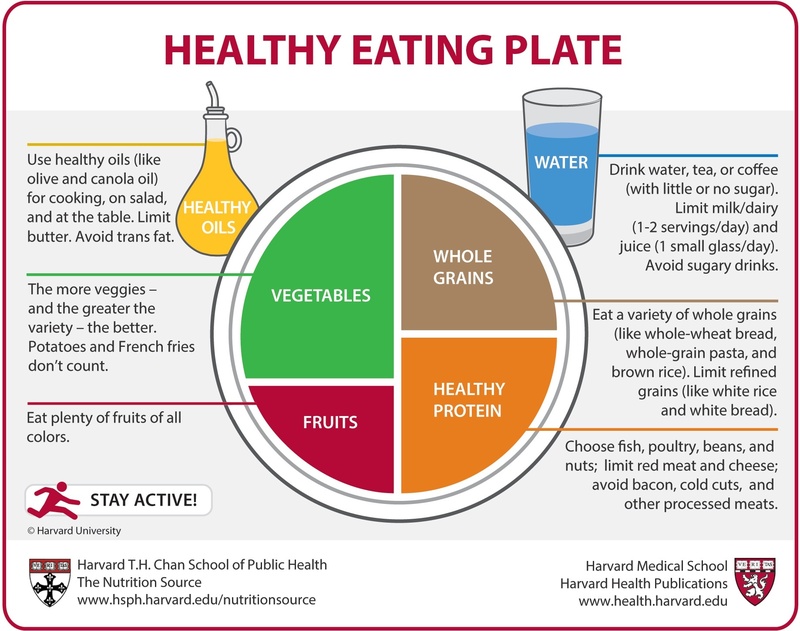 The plate above by the Harvard School of Public Health gives very useful advice on what a healthy plate should contain. It helps to remind ourselves that our body is a blessing from God, and that it has a right on us. We should therefore be aware of what we are feeding it. Be the first at work, at school or at home to make some small, but continuous, changes that can make you feel significantly more energized. Start your day with a balanced and tasty breakfast; homemade Muesli. In a small bowl add half a handful of oats, ½ a chopped apple and ½ a banana, sprinkle some desiccated coconut and cinnamon powder, add 3-4 almonds and walnuts (unroasted, unsalted and unsweetened) and a few pumpkin seeds. Add fresh organic milk, yogurt, soya, coconut or almond milk. If you are too tight with time in the morning, you can always turn the above recipe into a smoothie and drink it on your way to work! Fresh fruits with a few nuts make a great snack. Fruits are a good source of fiber for gut health, vitamins, minerals and anti-oxidants. To get the best benefits make sure to vary your choice of fruits. Nuts like almonds and walnuts have high nutritional value, as they contain proteins that help slow down the release of natural sugars from the fruits as well as keeping you fuller for longer (Weatherby, 2004). Nuts are also a good source of the essential fatty acids, particularly walnuts, while almonds provide a good source of magnesium which is essential for energy production (Osiecki, 8th Edition). Maintaining balance and moderation in life gives us the energy to realistically reach our goals. According to Mary Ann Bauman, a US doctor and fatigue expert, unfinished tasks are major energy stealers. She advises that if at the end of the day, you sit for a few minutes and focus on what you have completed, and have a few ideas on how to complete tomorrow’s tasks, you’ll leave work or any task you are doing feeling satisfied, accomplished and energized. It is also very relieving to keep in mind the hadith of the beloved Prophet (PBUH) when he once asked a companion: “(Is it true) that you fast all day and stand in prayer all night?” The companion replied that the report was indeed true. The Prophet then said: “Do not do that! Observe the fast sometimes and also leave (it) at other times. Stand up for prayer at night and also sleep at night. Your body has a right over you, your eyes have a right over you and your wife has a right over you.” – Sahih Al-Bukhari, Volume 7, Hadith 127. Joseph E. Pizzorno Jr., M. T.-B. (2008). The Clinician’s Handbook of Natural Medicine. St. Louis: Churchill Livingstone Elsevier. Liska, D. e. (2004). Clinical Nutrition A Functional Approach. Washington: The Institute for Functional Medicine. Osiecki, H. (8th Edition). The Nutrient Bible. Eagle Farm, Australia: AG Publishing. Weatherby, D. N. (2004). Signs and Symptoms Analysis from a Functional Perspective. Nutritional Therapy Association, Inc, R.
​Sherin Saad is a pharmacist that has recently qualified as a Nutritional Therapist from The College of Naturopathic Medicine in Edinburgh, UK. She is currently pursuing an M.Sc. in Personalized Nutrition. Sherin is interested in looking at how simple nutritional and lifestyle changes tailored for each person can have a big impact on the overall health and well-being of a person. Sherin is an Egyptian who was born in Sweden and raised between both countries. After her postgraduate studies in the UK, she has moved to Switzerland with her husband where she is learning more about how Muslim minorities cope in different European countries.